Footage of the crash that left TV presenter Richard Hammond fighting for his life has been aired for the first time as BBC Two's Top Gear returns. 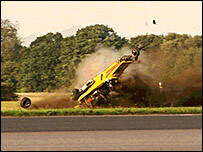 Hammond, 37, left hospital just five weeks after his jet-powered car came off a runway near York at 280mph. He received a hero's welcome as he returned to the TV show on Sunday. He said experts who analysed footage of the crash said he had displayed the reactions of a fighter pilot. 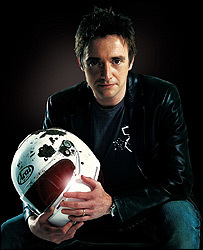 Hammond suffered serious brain injuries in the crash at Elvington airfield after a tyre burst on the Vampire jet car causing it to skid and flip over. The father-of-two, who has no memory of the crash, watched alongside Top Gear co-presenters Jeremy Clarkson and James May. Asked why he had attempted a final run in the car after having already reached speeds of 314mph, Hammond said: " I suppose it's like when you were playing outside as a kid and then your mum called you in for dinner. You'd always stay out for a bit longer..."
"And that's when you'd fall out the tree," Clarkson remarked. "As it happens, yes," Hammond said. Assuring viewers he had not suffered long-term brain damage, he joked: "The only difference between me now, and before the crash, is I like celery now." "I am fixed. I am completely fixed and normal," he said. He went on to thank the staff in hospitals in Leeds and Bristol, who helped him "when I was being stuck back together", and the many members of the public who wrote to him while he was recovering. Investigators have yet to give their verdict on the safety precautions taken by the programme.